Shop Electro Harmonix Battalion Bass Preamp and DI from AMS with 0% Interest Payment Plans and Free Shipping. The Battalion Bass Preamp and DI is a compact, flexible pedal that delivers powerful tone shaping capabilities in a rugged pedalboard-friendly package. 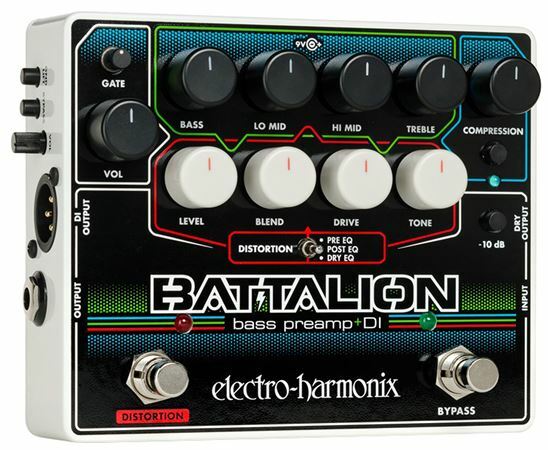 The Battalion is loaded with features that will appeal to tone conscious bass players and includes a four-band equalizer, fully-featured MOSFET distortion section with three signal path options, a compressor, a noise gate and comprehensive I/O. This preamp is doing exactly what I expected it to do. Clear blend of dry and wet signal. Love the option of where to place the distortion in relation to eq. The noise gate is a big plus! Very easy to use. Can get a great tone on the fly. Noise gate is a definite plus. I love having everything I use in one pedal!